Whether you grow your own sour cherries or pick them from an orchard at the height of cherry season, it's always a good idea to gather enough to freeze some for winter baking. You can choose to freeze sour cherries individually or packed in a sugar syrup. Either freezing method will produce delicious cherries suitable for use in a variety of ways after you defrost them. Place the cherries in a colander and wash them well under cool water. Drain the cherries. Pit the cherries with the cherry pitter. Place each pitted cherry on a baking sheet. Space the cherries so they are in a single layer on the baking sheet and not touching each other. Fill the baking sheet with cherries. Place the baking sheet in the freezer, and freeze the cherries for approximately one hour. Remove the baking sheet from the freezer and pour the cherries into a plastic freezer bag. Seal the freezer bag almost all the way. Squeeze the bag to remove excess air, then seal the bag completely. Write the contents and the date on the side of the freezer bag, and place the bag in the freezer. Keep the cherries in the freezer for up to one year. Pour 2 3/4 cups sugar into a bowl, then add 4 cups of warm water. Stir the ingredients well with a spoon to dissolve the sugar. 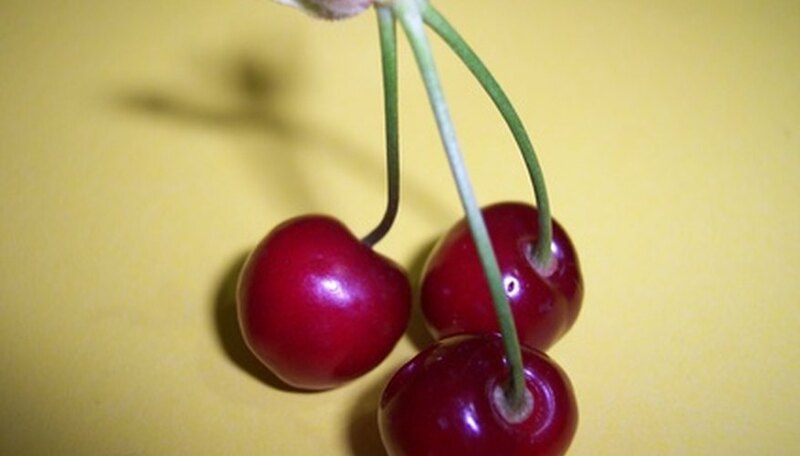 Place the sugar syrup in the refrigerator to cool it before packing the cherries. Wash and pit the cherries. Fill the freezer containers approximately three-fourths full with the prepared cherries. Pour the chilled syrup over the cherries in the containers until the syrup covers the cherries by approximately half an inch. Leave 1 inch of empty space at the tops of the containers to allow for expansion when freezing. Seal the containers, and label them with the contents and the date. Place the containers in the freezer. Store the cherries in the freezer for up to one year. This syrup recipe yields approximately 5 cups of prepared syrup. You will use approximately a 1/2 cup of syrup for each pint of cherries you freeze.